PCD Pharma Franchise in Bangalore – Leading pharma franchise company in India, Biofield Pharma welcomes all those who seriously intend to start their own business. Our company is a trusted ISO accredited company to bring you over 300+ ranges of drug medicines. These cover products like tablets capsules, injectables, powders, drops, syrups etc. We are bringing you PCD pharma franchise in Bangalore that opens doors to genuine business ventures across the city at most affordable business plans. Karnataka capital Bangalore has a good demand for medicines. The business of pharmaceuticals is flourishing and you could possibly get a good return. Biofield Pharma brings you business opportunities where you could start your own business and make a good profit. PCD pharma franchise in Bangalore is the best way to kickstart venture. We have GMP & WHO certified manufactured products list covering antibiotics, analgesics, antiviral, anti-allergic, local anesthesia, multivitamin etc. They are DCGI approved and are made under international standards of quality. You will be offered promotional tools benefits and improved marketing strategies for better growth and scope in the market. 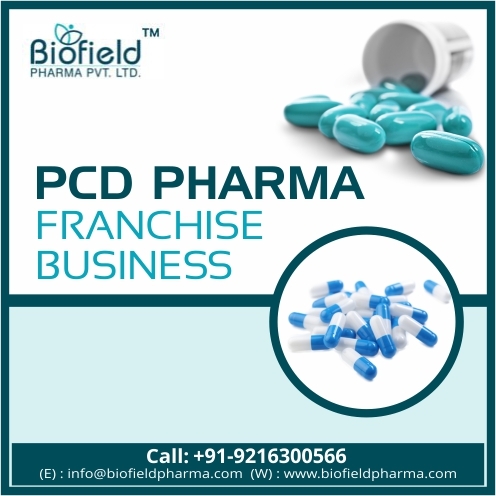 If you want to know more about our PCD franchise deals, then call us at +91-9216300566, +91-9216300166 or email directly at info@biofieldpharma.com to talk about the possible business opportunities and benefits in your desired location. You can even choose to go for a live chat system to talk to our representatives. You could find a good opportunity in the franchise business for those who want a change or want their own setup. Your own business gives you the freedom to enjoy better facilities and be your own boss. Go for pharma franchise business which is the best choice. As we all know, medicines are amongst the top priorities of expenditure today. People spend a fortune to stay healthy and fit. The demand for medicines in Bangalore is quite high. You will enjoy a befitting customer demand for medicines and franchise business actually does that work for you. The government policies are compatible with pharma businessmen where you can work on your own terms and get to own a vast amount of money. The income earned in this business is genuine and impressive when compared to other franchise businesses. Bangalore is amongst the heavily populated cities having million plus people living here. Therefore, enjoy good demand and customer base. The risk is quite low and you are likely to succeed more in this business. Our company brings you a variety of drug solutions to meet your different needs. We have been a reputed Pharma company known for its elaborate range of products. Over the years, we have a created a trustable base of 200+ associates as franchise vendors. Biofield Pharma is a respected name in the market which offers genuine pharma marketing plans. Affordable schemes are offered to dealers who want to start their business, expand their business or want to take their business to a different level. The marketing techniques that we use have been appreciated by all our associates and by being our member, you enjoy a good company with good features. We have effective DCGI approved drugs that cover more than 300+ formulations. Our company uses the best manufacturing services where the best environment is maintained. International quality control methods approved by experienced experts. Modern machines used for manufacturing purposes. Logistic partners across India which help us deliver our products on time. You could join us in our venture as a pharma PCD franchise distributor for Bangalore region. We were a proud, Bangalore based Pharma Company, we promise to deliver better business services.